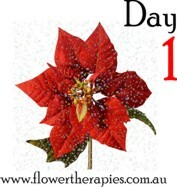 My New Blog Series looks at 12 Essences over 12 Days! Are you one of the thousands of people who arrive at January each year, breathing a sigh of relief that all the madness is over for another year? Are you normally grateful that you can forget about Christmas for another 10 months (although it seems to arrive more quickly every year)? Well if you answered yes to either or both of the above questions, then relax and enjoy my new blog series! Given that we have again arrived at ‘that time of year’, I deemed it the perfect time to take a quick look at 12 Essences from the Australian Bush Flower Essences range over 12 days, showing how you can use them to maintain your own level of calm this ‘silly season’ and beyond. By using some or all of these Essences, you may just arrive at January holding onto a sense of inner calm and even the feeling that you actually enjoyed your festive season (or at least parts of it)! So without further ado, here’s the first article in the series (and be sure to check back each day for the next Essence or even better, subscribe to my blog and we’ll send you a reminder). On the first day of Christmas, Australian Bush Flower Essences gave to me… Bluebell Essence (Wahlenbergia species). Let’s start by laying the foundations for ‘inner peace’ this season, since I consider Bluebell Essence to be a great preparatory tool for the Christmas season. There is no stronger force within you than your heart: both physically as the amazing electro-magnetic pump that it is, but also as an ever-loyal emotional guide that always offers up wisdom (regardless whether you listen to it or not) and has the ability to guide you back to stability when things seem out-of- control or too much to handle. New studies have shown that “the heart is an intelligent system profoundly affecting brain processing”, so by working to strengthen the heart, we are actually increasing our own level of intelligence, and even helping our brain to function more effectively. So how can Bluebell Essence help you better prepare for the festive season? Opening your heart: Of course a muscle will work better when it is strong, but any trainer will tell you that flexibility is just as important as strength. Bluebell Essence can help you to open your heart more and become more flexible in your interactions, outlooks and perceptions: thereby strengthening your heart and increasing its impact on your wellbeing. By being open to people and events happening around you, you are better armed to ‘cope’ with family gatherings, respond positively to the constant sensory onslaught provided by advertisers and release the need to create such a materialistic Christmas. A positive ‘side-effect’ is that you may become more open to the opportunities for fun and friendship that the ‘old you’ may have overlooked. To think of it even more simply, try this little analogy: if you were trying to catch rain in a bucket, would it serve you better to have a large, open bucket that can hold more water, or a bucket that is already full of other previously-collected things or worse still had a lid on it, preventing you from filling it at all? Creating a greater sense of generosity: In the true sense of the season, Bluebell Essence can enable you to open your heart to being more generous: and if you are able to open yourself to that possibility during the Christmas-season, who knows what future benefits in the New Year you will enjoy as a result of this new way of being? And if you still aren’t convinced, what better way to overcome the materialistic aspects of the season than to find someone who doesn’t have as much as you do, share what you have and brighten their season as well (for a few great giving ideas, try The Salvos, The Smith Family or a local charity in your area). Welcoming Abundance: Despite what we have normally been told, it is just as important to receive as it is to give (we need not feel guilty because we like to receive gifts!). The heart again teaches us this lesson: could you live without breathing in or breathing out? In fact, both functions are as important to our survival, and so is the ability to receive as well as to give. So if receiving gifts from your loved ones is a problem for you at this time of year (and this doesn’t just mean the physical gifts, but also the offers to help, generous invitations and other kindnesses we often refuse), then Bluebell Essence can help you. Improves circulation: You may be noticing ‘co-incidences’ in the literal and implied meanings of some of the words used in this article, and yet another example is when we ‘circulate’ better with others, our own inner ‘circulatory system’ performs and flows more effectively (I’ll cover the importance of the words we choose to use some other time!). So if you find yourself becoming the perpetual ‘wallflower’ at your Christmas functions, then some Bluebell Essence may help you to share more of yourself during festivities without having to first consume countless drinks to lose your inhibitions (the plus side is you won’t wake up horrified when recalling the previous evening’s work Christmas party!). And who knows, maybe you’ll create a new friendship, relationship or even some heart-felt business connections to start the New Year off with a ‘bang’. Choosing gifts ‘from the heart’: You would know as well as I do that every company wants to ensure you become a big-spender at this time of year. So if you are feeling ‘dis-heartened’ by Christmas (there are those ‘word co-incidences’ again! ), then why not try some Bluebell Essence to help you feel more connected to your heart, and instead give the people in your life the perfect gift of yourself – no strings attached, no more useless gifts or credit-card regret come January! So there you have it: a small list of the benefits that the Australian Bush Flower Essence, Bluebell, can add to your Christmas. Instead of ‘losing heart’ again this year (note those words again! ), try taking Bluebell Essence and you will be more allowing of the festivities and trimmings that accompany Christmas, and who knows – you might just have some fun. Make sure you check back for the second day of Christmas Essences tomorrow (remember, the easiest way to remember is to subscribe here). Thanks so much for your feedback! I’m honoured that you enjoyed it so much and have even bookmarked it. Make sure you subscribe here http://bit.ly/hC21d8 so you don’t miss any future posts!